There’s something about a good pair of hiking boots. As you stomp over hill and dale, a good pair will propel you forward and make even the hardest climb feel pretty good on the old feet. They’ll feel part of you. Wear a bad pair of boots or other inappropriate footwear and you’ll know. Your feet will ache and feel sore in no time. You won’t get the support you need to tackle those climbs. Walking does not feel like a joy in bad footwear. Before I bought my hiking boots back around 2003 or 2004, the only boots I had were my Doc Martens. They were fine when we were doing relatively urban walks like the London Loop, however once we got a bit more adventurous, it was quickly clear they weren’t going to cut the mustard. I invested in a proper pair of Berghaus boots and didn’t look back. Those boots went all over the place. As well as tramping a lot round the south of England, I did two thirds of the Pennine Way, spent some time around Edale, the Isle of Wight and the Pentlands too. They went on holiday to Iceland, to Norway, and to Switzerland as well as propelling me on a walking holiday through the Queyras Alps. This year they took me along the West Highland Way, and up Ben Nevis. There was just one little problem. The leather had begun to crack. True it probably wasn’t helped by warm weather, me insisting on dipping my boots in lochs everytime I could, and by not polishing or conditioning the leather during the holiday. But to be honest, all my boots tend to crack at some point in the end – must be something to do with my big feet and the way I walk. Back home I gave them a good polish up, doing my best to keep them going. They got me along a few more walks over the summer, and joined me up on the Cumbria Way. Alas the Cumbria Way was not too kind on my already fragile boots. Two days I spent walking in pouring conditions. There was so much water the Gore-tex didn’t stand a chance. Sodden boots required drying out in hostel drying rooms which probably didn’t help things either. By my final (thankfully dry) day of walking, they were looking very sad indeed. One boot was faring better than the other, which had chunks of leather hanging off and the Gore-tex lining quite clearly visible. As I walked the final miles into Carlisle, I knew they were through. Sadly, I needed a new pair. And as I sat outside Carlisle Cathedral, I took them off for the final time. I placed them in front of me and looked at them. 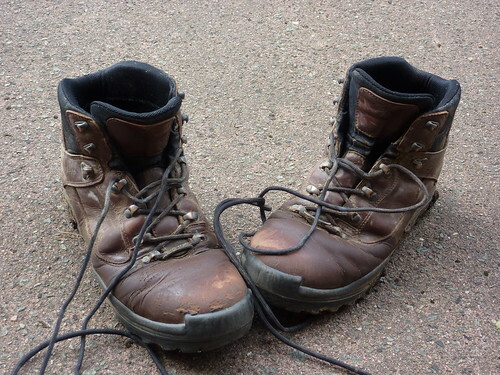 The leather had chunks and scuffs – remnants of a particularly rocky day on the Pennine Way some years before. They were still damp from the previous days rain. They were battered; they were bruised; but bloomin’ hell, were they comfortable. I took the laces out – unlike the boots they clearly had some life left in them. Impressive given they’d never been replaced. I spent quite some time just looking at them. Remembering the times we’d had together. There’s blood, sweat and tears in those boots. They’d been with friends; they’d been alone. Memories of sights good, and some not so good. But memories none the less. Those memories are ultimately why it’s hard to get rid of hiking boots. It’s like saying goodbye to an old, dear friend. I placed my boots into a carrier bag I had, looked at them some more, and eventually pulled myself away. Leaving the cathedral grounds, I walked round Carlisle a bit more; reluctant to say goodbye. There was clearly no point in taking them back to London, but I couldn’t let go. In the end I forced myself to place them in a bin near the castle. It seemed appropriate that they remained in Carlisle, end of the Cumbria Way. As the Cumbria Way ends near a bin lorry depot, so my boots found a new home in the waste receptacle of the local council. I gave them a moments silence, then headed off in the general direction of home. That was very touching, I understand completely. Am doing the C2C this summer and am agonizing over footwear — I have a pair of fairly heavy traditional (but goretex) leather Zamberlan boots with a serious shank, that I used for the Cotswold way a few years back, but am thinking about either fabric-based goretex boots or about even using trail running shoes — I used a low cut pair of Salomons 2 summers ago on the West Highland way, and the only real downside was the lack of ankle stability on the very eroded rocky trail. Otherwise, the lighter shoes made for an easier week’s walk than on the Cotswold Way in big boots. Some of your photos from the C2C suggest that this will be a big issue again this summer, but do you have an opinion about the shanks/stability vs no shanks/flexibility? I generally find my feet are less beat up and tired with less of a boot on my feet, but the C2C is longer than those other walks, so maybe that is a consideration too. Hi Bill – the Coast to Coast is a bit of a mixed bag. Certainly through the lakes, and many other sections too, you’ll really benefit from having some good ankle support as it can regularly be rocky or hilly. That said, I’ve only ever walked in leather boots – I’ve found them to be better for my ankles and knees, even on shorter and easier paths. My last three pairs have all been Berghaus Explorers because I found them to be extremely comfortable although they didn’t last very well, whilst not being too heavy. Although two of the pairs barely lasted beyond 500 miles before the leather cracked. I’ve never walked in fabric boots – find leather much easier to clean! I’ve seen people using old boots as flower pots. I might do that when mine are eventually finished, but they have some life in them yet. Off to Edale this week to do the Peak District stretch of the PW. I am just starting to plan my trip for next year starting with some local 5 mile walks and building up from there, I have been looking at buying the Berghaus Men’s Expeditor Ridge 2.0 Walking Boots (http://www.gooutdoors.co.uk/berghaus-expeditor-ridge-2-0-walking-boots-p439480) and while i am confident these will be ok for starting off are these type of boots suitable for the Pennine Way? 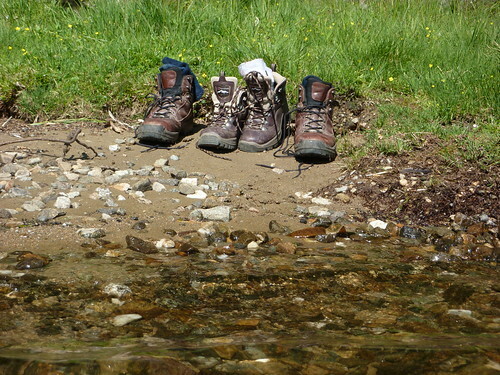 Hi Jeff – I walked the Pennine Way with Berghaus Explorer boots. They coped well with the rigours and demands of the trail. I’m sure these ones will be fine if they fit well. How do you know leather is much easier to clean if you have never tried the alternative? You wash fabric boots and trail shoes in a bucket of water. They come up like new most of the time. I have Salomon Quest 4D GTX boots and really like them. They have locking cam hooks so that you can tighten the foot lace differently to the ankle. My only real criticism is that Salomon will not sell you replacement laces and they need to be the same diameter and density as the originals otherwise they don’t lock as well. One of mine got nibbled by a mouse in the garage last winter and I found it difficult to fins some good replacements. I guess that if you keep them away from rodents the laces will last longer than the boots which may explain Salomon’s otherwise strange marketing decision. Their trail shoes are also excellent. Don’t go for Gore-tex ones though as once they are wet inside they are more difficult to dry. If you want to keep your feet dry use Gore-tex or seal skin socks in shoes that are made of a fairly open mesh. You can also wear them dry in camp by having your feet in clean dry socks in a plastic bag in the shoes. Hi Phil – you’re right. I’ve never tried cleaning a pair of fabric boots. But my usual technique for removing mud off my leather ones involves blasting them with water from the shower or a hosepipe. It makes cleaning them a complete doddle. First Published: 28 October 2009. Last Updated: 12 August 2015.